Change hardware: Replacing knobs, pulls, and hinges cost as little as a few dollars per door. Make sure the new hardware matches the existing hole locations. Paint: A coat of paint can brighten up old cabinets and cheer up the whole room. (Metal cabinets can be sent out to an autobody shop for a durable refinishing.) The cost of a professional paint job: about $35 to $85 per linear foot. Reface: Refacing can make cabinets look brand new. First, doors and drawer fronts are removed, and all exterior surfaces are covered with a veneer of prefinished wood in whatever species and finish you prefer. Then new doors and drawer fronts are made to match. Make sure to hire a reputable company, and only after you've seen examples of its work. Cost: approximately $125 to $325 per linear foot, depending on the type of veneer and the method of installation. Change doors: It's possible to replace just the panels on cabinet doors. Decorative filler panel options include glass (clear, etched, tinted, patterned, stained) and metal (stainless steel or punched or patterned tin). Simply use a router to cut away the existing panel and rout a lip on the back of the door to hold the new panel. Replacement panels typically cost from $100 to $250 per door. Other options include removing the doors altogether (free!) for an open-shelf look or replacing them with new doors ($100 to $400 per door). Add moldings: Wood moldings and trim add character to plain cabinet fronts. If your old cabinets don't go to the ceiling, adding a crown molding or soffit around the top will make a room look more elegant. Cost: about $15 per linear foot, unfinished. Upgrade interiors: Slide-out shelves, tilt-trays, lazy Susans, drawer dividers, and full-extension drawer glides can be retrofitted to your old boxes. Cost: $1,000 to $3,000 for a full kitchen. Reface: Some refrigerators and dishwashers are designed with frames to hold face panels — typically a stainless steel sheet or a wood panel. Replacement panels cost from $100 to $800, depending on the size of the appliance and the material. Even if the appliance doesn't have a frame, panel kits (including frames, panels, and handles) can be custom-ordered for just about any make and model of appliance, in a variety of materials (www.frigodesign.com). Cost: $175 to $1,000 per appliance. Replacements for worn-out stove knobs, burner plates, and glass cooktops can also be ordered from the manufacturer. Paint: If you have a high-end appliance or an antique that's lost its luster, metal surfaces can be painted by an appliance refinisher or an autobody shop for about $100 (for an oven door or dishwasher panel) to $300 (for a whole fridge). Porcelain stoves can be porcelainized by an appliance or bathtub refinisher for about $100 for a single oven door and roughly $1,200 for an entire range. Resurface: Refinish an existing wood floor and stain it a different color or add stenciled borders ($550 to $700 for refinishing a 200-square-foot kitchen; a simple border might cost an additional $200 to $1,000). Stone flooring can be professionally polished to bring back its original luster. Cover: If the floor is sound and flat, you may be able to cover linoleum or wood with a coat of flooring primer and paint, or a layer of stick-down vinyl tiles or sheet flooring. Cost: about $200 for paint, $500 for vinyl. Resurface: Stripping an old laminate countertop off the plywood deck is fairly simple; installing new laminate costs about $30 to $40 per linear foot. Ceramic tiles can also be installed over existing plywood. And if your solid surface or stone countertop is showing its age, the surface can be professionally polished to remove the marks. 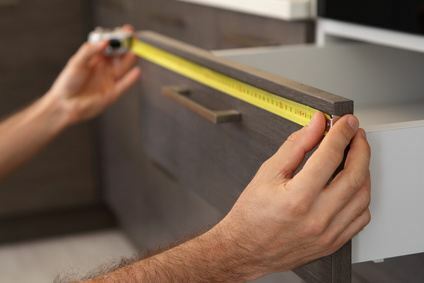 Add moldings: To dress up a laminate countertop, add molding around the front edge for about $5 per linear foot. Replace just a section: If you don't want to rip out the whole countertop, consider recessing a different material, such as a chopping block, into part of an existing counter. Add a backsplash: If you're not replacing countertops, you can change the backsplash. Good choices: laminates, ceramic or glass tile, beadboard, even metal ceiling squares.